In recent months there has been a lot of publicity about the manner in which poultry is farmed in the United Kingdom. The emphasis of this media interest is centred on how the poultry is reared – and in some instances force reared – to produce a constant supply of poultry for the ever growing number of supermarkets across the country. It is important to remember that for many families this kind of poultry is the only kind that falls under the umbrella of their food budgets and as such the demand is high as many families in the United Kingdom live on incomes well below what is considered to be the national average. But what are the differences between those chickens, ducks, turkeys and geese that are reared within the confines of large manufacturing houses and those that are allowed to graze and enjoy the freedom of the outdoors? As the name might suggest the process of Intensive Farming is decided to speed up the growth of poultry so that it is ready for slaughter and subsequent sale much faster than their organic counterparts. Intensive Farming – often referred to as Battery Farming – is based on the principle of the more the merrier and chickens and turkeys are often confined to large sheds where they are kept in cramped conditions and fed with foods that will increase their body weights over a short space of time. This is an inhumane practice but is a practice that has been in operation in many countries around the world for decades and its growth is mirrored only by the demand for the poultry farmed under these conditions. Also it is determined by costs which are considerably lower than those incurred through organic poultry farming. Chickens which are bred for their meat roam amongst each other on the floors of these sheds whilst their egg-producing counterparts are confined to tiered cages above them. At the time of writing this article, roughly 90% of meat producing chickens and 60% of egg-producing chickens are intensively farmed in the United Kingdom. Organic Farming works on a far more relaxed scale with poultry allowed to experience a life outdoors and in conditions that many consider to be much more befitting of such creatures. Allowed to eat as much or as little as they like and also to roam within a much larger designated area - the poultry when it is slaughtered is said to taste much better as a result of grazing on grasses more conducive with their digestive systems. In the case of chickens when they are farmed organically, they are cooped from they are a day old until they are three to four weeks old at which point they are allowed outside of the coop. In order to assist with their feeding they are kept in large outdoor pens where they have room to move, eat and drink. Poultry are notoriously shy when it comes to their eating habits and if they are fed indoors will not attempt to find food outside. Many organic poultry farms steer clear of genetically modified feeds which in turn is passed onto the customer in the flavour. However as a downside there is also an additional cost to the customer as the farming of organic poultry takes longer and costs more to oversee. That said, a great many people believe that this is a much more humane way of breeding the birds and also gives them a more intense and distinct flavour. 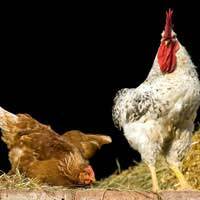 At this time the debate rages on as to which is the best way forward for poultry farming in the United Kingdom and as the debate continues so to does the demand for poultry farmed in either way.